“To catch a cure for cystic fibrosis". As a keen fly fisher and guide on Hampshire’s chalk streams, fly fishing in a tropical saltwater tournament requires a whole new approach. Forget the 3 and 4 weight outfits, forget whispering to a client suggesting a gentle upstream cast and forget the raise of the rod tip to set the hook as the trout sips under a size 16 Greenwell’s. These environs require double hauls on a 10 weight straight into the trade winds, with a fly that feels more like you’re casting a coat hanger. A suffer no fools’ backcountry guide breathing down you neck, yelling strip strike! ………The hook is set. I’m told to play the fish hard. 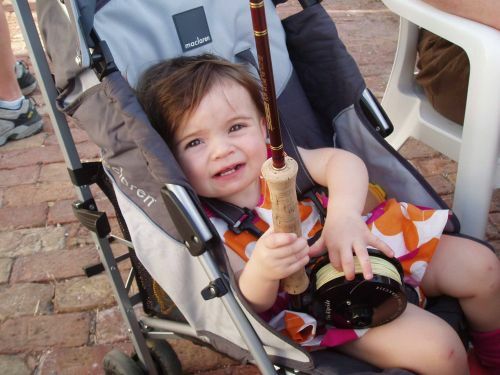 The rod down for maximum power – it smokes 150 yards of backing through the tip ring. I now know that time is of the essence when fishing a tournament in Islamorada! The Super Fly Tournament starts the three day event. 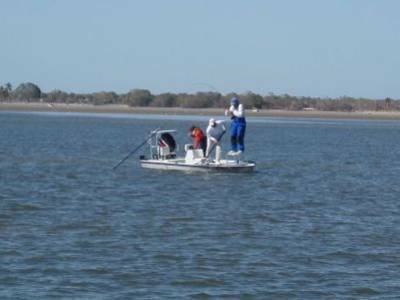 This fly only one day competition requires angler and guide teams to select one pattern of fly. The Super Fly. It is photographed with the team’s disposable camera and submitted to the officials. 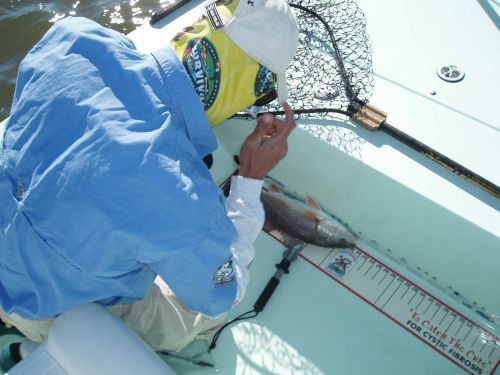 The fly must be used throughout the day to catch as many slams, of redfish and bonefish as possible. A tricky task as reds live in the backcountry Everglades National Park and bones live on the ocean side of the Florida Keys, nearly an hour’s skiff ride between the two. The team tactics are worked out the evening before over a cold beer or two. The event is started at 8am sharp the following morning complete mayhem as a hundred powerful fly fishers’ skiffs zoom in all directions some opting for the ocean side first and others going for the backcountry. For Captain Pier Milito, my guide and I, things started well. 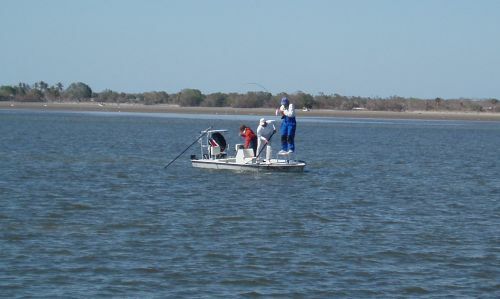 Under his expert direction we caught two reasonable redfish out back in the first two hours and photographed them both with our team camera against the official measure. Pier opted to head out of the back country for the more difficult bonefish on the ocean side. He poled me around all his best flats and for the rest of the day we only spotted two or three bones. None gave us a decent shot. It was heartbreaking as Pier thought we were on track to win the event with our two redfish if we could slam and get a bonefish as well. The hooter for the last cast is sounded at 3pm. My legs and eyes were tired from standing on the bow all day squinting into the shallow sea searching for signs of bonefish. At precisely 2.45pm Pier yelled. Tailing bones 200 yards at 2 o’clock. How the hell could he see them that far away I thought? Then the sun mirrored of off a tail and glinted at me got them. I daren’t take my eyes off that spot. As we edged closer I stared at the mark like a man over board drill on a sailing boat, determined not to loose them. I could see two and then three big bonefish tails and my heart was going treble time. Pier said. That’s a tournament winning bone right there buddy make that cast count. No pressure then! I replied sarcastically. As he manoeuvred the skiff into range, I wound up my best double haul shooting the Borski Bonefish Slider towards our target. Twenty feet short. Pier tried to get the boat a little closer as I was casting in 5 knots of cross wind. The shallow draft boat grounded as they were feeding in such shallow water about two feet from the beech. Those three tails wagged at me again and a big cloud of silt puffed from their dinner table. This time I hit the button perfectly. I let the fly sink into the soft sand and gave a sharp pull to make an enticing puff as it jigged towards me. The biggest bonefish shot towards the fly and I nearly lost all control with the apprehension and excitement. Pier whispered strip slow and get ready, he’s gonna eat it. I twitched again and that double figure bone followed. I could just feel that tug when the other two bones were suddenly spooked by something and fired out to sea alarming their team mate. He left my fly to join them. I was gutted. As I sat down on the bow, I could have wept. I looked at my watch – It was bang on 3pm – end of day. We headed back to the dock heads hung low. 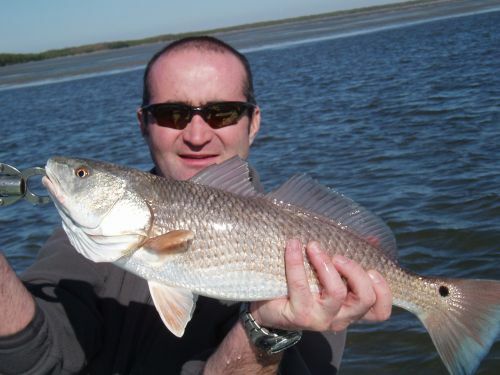 With all teams back we looked at the scoreboard we finished in a respectable third place with our two redfish. With a slam we would have been in the prizes and with that monstrous bonefish we would have won! A limey winning the Islamorada Redbone, now there’s a thought! That’s fishing eh! 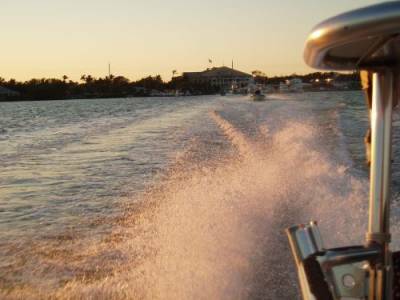 We have been invited back to fish in the 2006 Redbone this December – look out for the forthcoming journal entry. Come on England! The Cheeca Lodge REDBONE is one in a series of REDBONE charity tournaments raising funds for cystic fibrosis. What an experience, I absolutely loved it and I’m very proud to take part. A very big thank you to Bob and Mindy Rich please see www.redbone.org.